Jobs for the Provincial Management Service (BS-17) PMS have been announced by the Public Service Commission, I will provide you complete information regarding all these jobs and will tell you how to apply. 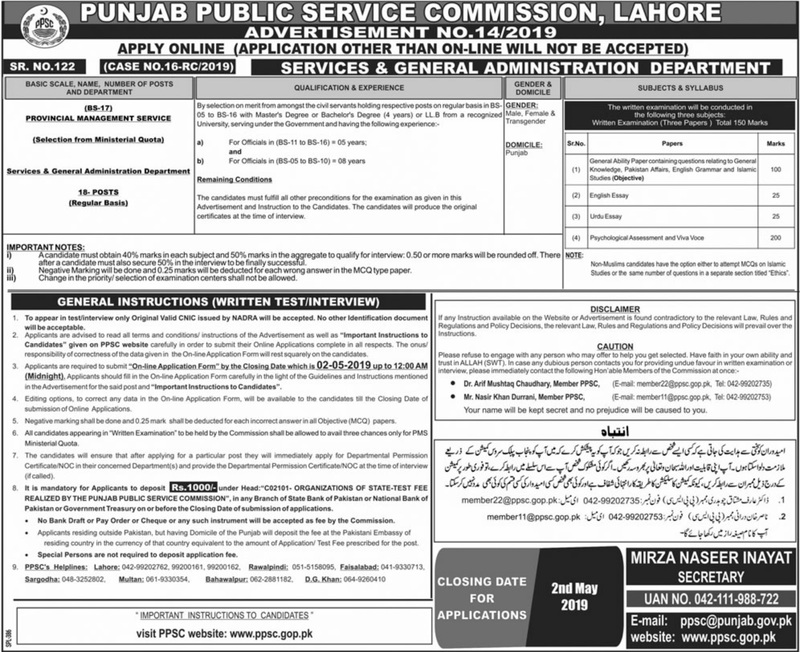 provincial management service job 2019 in punjab. PMS Jobs April 2019. PPSC Latest PMS jobs. PPSC advertisement No.14/2019. pms jobs 2019 advertisement for suitable individuals.18 positions of Provincial Management Service(PMS) are vacant. 1) A candidate must obtain 40% marks in each subject and 50% marks in the aggregate to qualify for an interview: 0.50 or more marks will be rounded off. 2) Thereafter a candidate must also secure 50% in the interview to be finally successful. 3) Negative Marking will be done and 0.25 marks will be deducted for each wrong answer in the MCQ type paper. How to Apply for PPSC PMS job 2019?